Dear Salty: Fellow server here. I need your advice on an annoying problem that comes up every few weeks: the table that just won’t leave. After I’ve made sure there are no more drinks coming and no one wants the dessert menu, I leave the bill, it gets paid, and then… nothing. Honey, I hear you. In fact, we’ve answered a question like this once before, but there’s always more to say. Because on one hand, we want people to enjoy their time here! On the flip side, enjoying themselves can also mean messing up our restaurant’s clockwork rhythm. At my diner, we call these guys “campers.” We see them pitch a tent and know they’re not going anywhere. You have to be a special kind of socially tone-deaf to not realize how your extended hangout is inconveniencing your servers, your fellow diners, and this restaurant you apparently like, otherwise why are you eating there? I once worked a lunch shift where this old couple literally brought out a photo album and went down memory lane, while I gnashed my teeth in silence because they looked so sweet. Because that’s the other side of it. Maybe a separated couple is reconciling during that extended post-dinner coffee. Maybe two long-lost friends are reconnecting. Maybe a first date is going so well that neither party wants to stop the conversation. Magic can happen in restaurants. I’ve seen it. So, let’s say they haven’t paid yet. The answer is simple: You drop off their check. Maybe (hopefully) they’ll get the hint. Next level: They have paid but they don’t leave. There’s a saying in our industry: “The less they have on the table, the less the table is theirs.” This means you take everything away from them—their napkins, their water, the silverware, the salt and pepper, until there’s nothing left on the table. You’re slowly making it as obvious as possible. Still there? Try this: Does your restaurant have a bar area? See if you can push them over there. I’m surmising that this group is drinking (I dunno, just a guess), so if they ask for another round, that’s the perfect opportunity to steer them that way. I’ve even had a situation where the restaurant where I worked bought a group drinks at the bar next door. Yes, it was a little pricey, but it also saved us from taking a hit, because not having that table available for the next party means that we’re losing money regardless. If all else fails, you have to go for the direct nuclear option. Just tell them as nicely and honestly as possible. “I’m so sorry to interrupt. We do need this table for another reservation.” A restaurateur, I forgot who, famously once said, “At the end of the table, servers are just human beings taking care of another human being. Talk to them.” If they don’t get it after all of that, then yeah, I wouldn’t be too broken up if they don’t return to your establishment. Let them go squat at someone else’s restaurant for awhile. Good riddance and on to your next table. 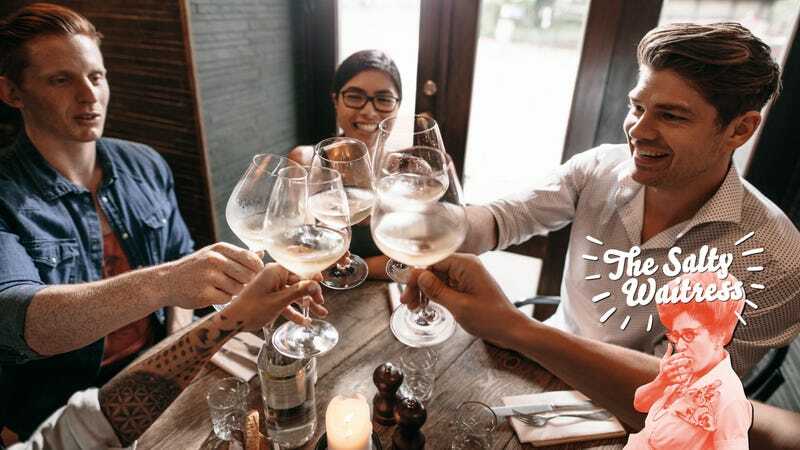 Ask The Salty Waitress: Why won’t restaurants seat incomplete parties?